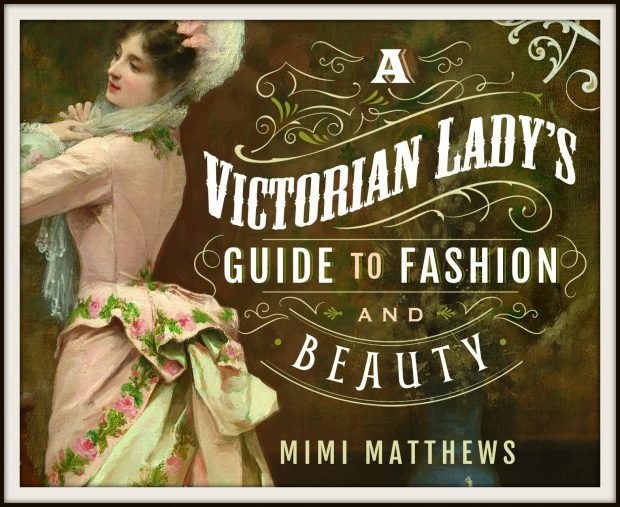 Today is the ebook release of my non-fiction fashion history book A Victorian Lady’s Guide to Fashion and Beauty! Complete with over 60 images, it provides an overview of fashionable women’s clothing, accessories, and beauty essentials from Queen Victoria’s ascent to the British throne in 1837 to her death in 1901. When writing this book, I confess, I focused on the elements that would help me most when outfitting characters in my Victorian novels. Thus, the book is divided into sections which I hope will make it user friendly for anyone who (like me) needs to quickly reference the most fashionable gowns, hats, shoes, undergarments, or jewelry for any given decade. Along with descriptions of relevant fashions, I’ve also included sections on historical events to help put the fashion trends in greater context. There’s even sections on the House of Worth, Empress Eugenie, the advent of the Victorian department store, and the dawn of the black evening dress. For more about A Victorian Lady’s Guide to Fashion and Beauty, including reviews and buy links, click through to its official book page HERE. Or, to order the ebook directly from Amazon, Amazon UK, iTunes, or Kobo, simply use one of the links below. If you’d prefer to wait for a hard copy, the paperback version will be out in the UK next month and in the U.S. sometime in November. If you purchase a copy of A Victorian Lady’s Guide to Fashion and Beauty this week please do stop by my Facebook or Twitter page and let me know so that I can thank you personally. And please don’t forget to leave a review at Goodreads and/or Amazon!